Fireplace safety for seniors is serious business. Do you remember the cozy fires you had at home with your parents when you were a kid? They were careful to teach you about the dangers of fire and to make sure you kids learned what was safe. Now it's time to turn the tables. There are new fire dangers as your parents age, so you'll need to make sure you learn about them and show your parents what is safe. Nearly 14,000 house fires each year are started by fireplaces. And most of them were preventable. If you also consider that senior citizens are injured or killed at 3 times the rate of others, then fireplace safety is essential for your aging parents. Have a professional chimney sweep inspect and clean your parents' fireplace, wood stove, and chimney at least once a year. The tar in the chimney (creosote) can build and set your chimney, roof, and the whole house on fire. They will check that the chimney is clear of any nests from birds, squirrels or other animals. If needed they can install a chimney cap to keep debris and animals out of the chimney. They'll also cut back or recommend that any limbs be cut to keep the top of chimneys clear of tree limbs or debris. You'll want to follow these tips from the Chimney Safety Institute of America. Before the sweep starts work, he should ask you about any known chimney problems, past repairs you’ve had made, and how often you’ve used the fireplace since the last sweeping. He’ll place drop cloths around the work area and shut off the furnace. Next, he’ll head up to the roof to inspect the chimney and flashing and look for potential problems, such as overhanging tree limbs. He’ll clean the chimney from the roof, then come inside and clean the firebox using brushes and a special vacuum. Make sure wood stoves are properly installed, away from combustible surfaces, have the proper floor support, and adequate ventilation. Inspect the fire brick in the fireplace. If you see any open mortar joints have them repaired immediately! A fire can spread into the stud wall behind the masonry fire brick through open mortar joints. A chimney or fireplace that is damaged or functions badly could lead to carbon monoxide poisoning in your parents' home, a very common problem in an older home. 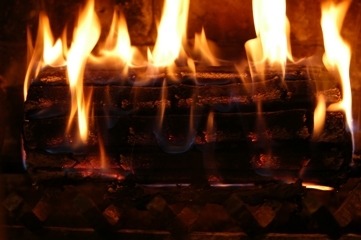 The fireplace and chimney can also be a major source of cold air leaks in winter. So the professional inspection is essential before they are used in the coldest season. In inspection must include the flue damper operation. They will check to make sure it opens and closes fully, and that it is able to be locked in the open or closed position. A basic inspection and sweeping will cost about $150 to $300 and last up to 90 minutes. Our aging parents do need our help. While not about seniors, I share part of this blog post by Leah Ingram to reveal the dangers of winter fires. Fire Safety Month could mean life or death for our aging parents. We readily teach children about fire safety. In reality, older adults suffer twice as many fire deaths as the general population.